Star Wars: Battlefront is probably the most hotly anticipated games of 2015, or of all time really. And now real gameplay details have emerged from a closed gameplay viewing, even though those details are still under NDA until later today. An AP report has surfaced that has a great amount of details regarding Star Wars: Battlefront and the kinds of massive battles we can expect. The demo was already shown at Star Wars Celebration to a closed group of viewers, though someone was excited enough to disregard the embargo. Releasing November 17 2015 on the PS4, Xbox One and PC, you’ll be able to participate in massive 40 person ground and air battles on some of the locations that we already know and love. Hoth, Tatooine, Sullust and Endor are all confirmed locations that you’ll be able to play, and there are likely going to be several other planets when it releases. 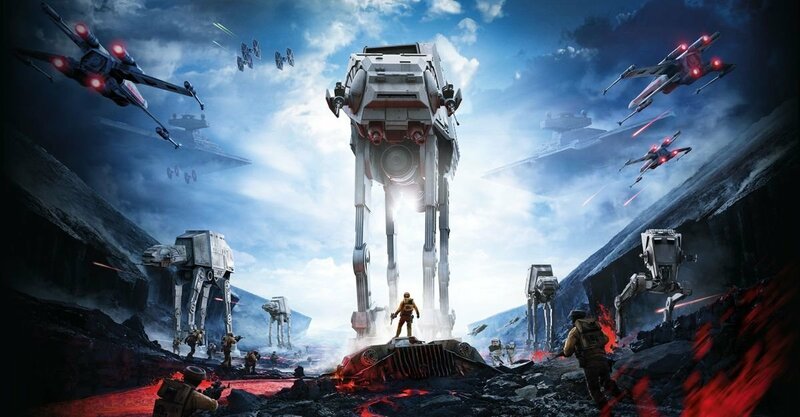 Vehicles will play a big role in Star Wars: Battlefront, though not like in Battlefield 4, as they’re aiming for a more balanced approach while still letting us interact with some of the iconic vehicles like the AT-AT, AT-ST, Snow Speeder and even participate in air and space battles in X-Wing’s, TIE Fighters and the Millennium Falcon. DICE apparently has stressed that the transition between air and ground combat will be seamless, but were coy about actual details. The balance between infantry and vehicle combat should certainly be much better than in past games. Just as in past Battlefront games, you’ll be able to take control of the hero’s and villains themselves, playing Sith and Jedi alike. The idea has evolved to let you assume a leadership role on the battlefield, letting you affect the outcome. Also noted is that there will be a free DLC available two weeks before the opening of Star Wars: The Force Awakens that will let players play in the Battle of Jakku, a massive battle over and on the planet of Jakku that occurs after Return of the Jedi. Jakku, of course, is the planet featured in the trailers of Star Wars: The Force Awakens. We can see the remnants of the battle in those trailers, but in Star Wars: Battlefront you’ll be able to see the battle up close and personal before the movie hits theaters. LucasArts hopes that this 10 year relationship helps to create a whole new way to experience the Star Wars galaxy, and not just a movie-to-game port. They are committed to bringing the famous deep storytelling to the game world, and not just using the brand irresponsibly. Thanks to StarTribune and the AP for having the early scoop on this most wonderful of games.